Yet another detail shot against the sea, and even against the sunset this time! Colours were incredible and I took a couple of pictures that evening. 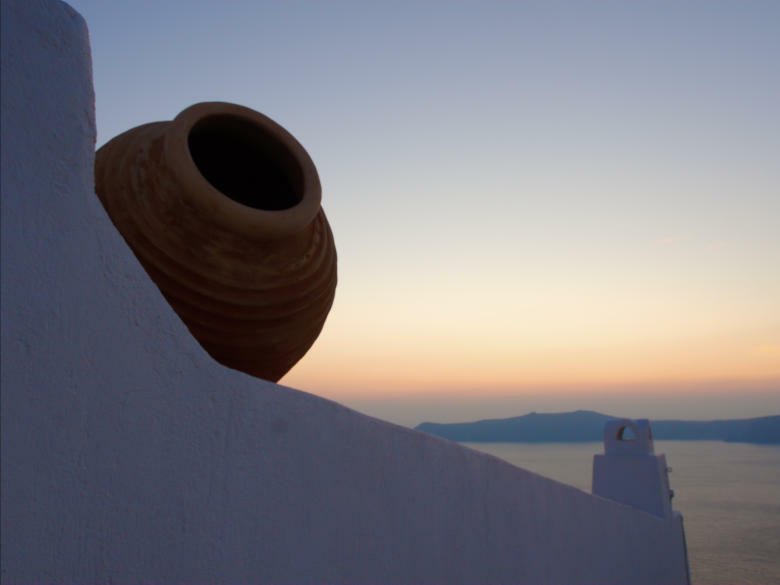 I can't remember the exact place this pot is located, but it is somewhere close to the end of Fira when walking to Oia. I took another shot of the same pot in the morning, but I thought of posting this one first because of those subtle colours — although I'm not really happy with the balancing of the chimney on the bottom right. Post-processing mostly is a blending of two exposures pulled from the same raw file. When checking the original, you'll see that light way pretty bad in the foreground... but nothing that can't be fixed with a couple of exposure correction layers, right?